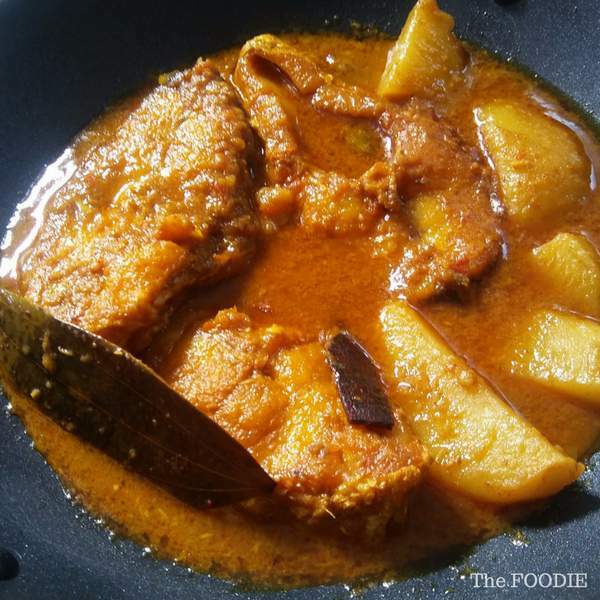 Bhetki fish Kalia with potato/Bhetki machher Kalia is an age–old Bengali recipe. It is a delicacy in Bengal. 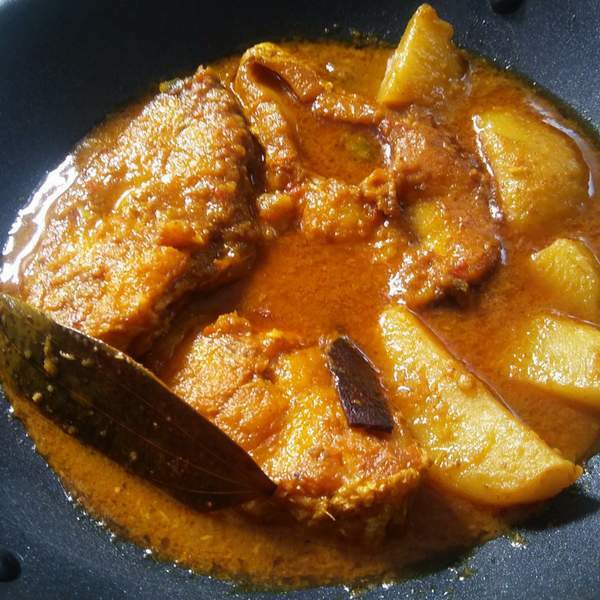 Bhetki fish is also known as barramundi or Asian seabass. This is a very delicious recipe, which normally serves with piping hot steamed rice. Try this recipe the way I did you are going to love this. Ingredients required for this dish are mentioned below. Take the fish pieces in a bowl and add 1/2 teaspoon of salt and 1/2 teaspoon turmeric powder. Now rub them well on both side of the fish pieces with the help of your hand. Cover and leave it for 1/2 an hour. Now heat mustard oil in a pan. Add fish pieces. Fry them in medium flame till each side becomes slightly golden brown. Remove the fish from the pan. Remember not to over fry them. Then in the same oil add sugar, bay leaf, cinnamon stick and green cardamom. Stir for few seconds. Add the potato wedges and fry for a minute or two in medium flame. Now add onion paste and fry with the potato for 2 minutes. Add ginger-garlic and cumin paste and fry for another 1-2 minutes. Add grated tomato and at this point add salt, remaining turmeric powder, red chili powder, and garam masala powder. Stir for 2 minutes. Add 1/4th cup water and stir till oil separates. Add remaining water and fried fish pieces. Cover and cook for 6 to 7 minutes on medium to low flame. Lastly, add ghee/clarified butter. Then serve. Till then take care and happy cooking!